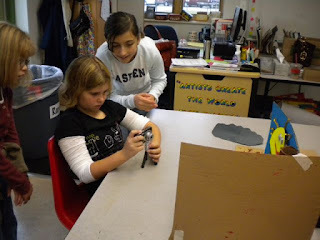 The other day I asked one of my 5th grade students to take some photos of a project that we were all working on together. The photos I got back were... how shall I say this... not good. I thought that these so called "Digital Natives" were experts in these types of things. But if truth be told they are not. Which is why I have come up with this new line: Owning tools does not mean that you have the skills to use them. A student might have an iPod Touch in their pocket but it doesn't mean that they know how to truly use it. Sure, he might be an expert at some games, but I am talking about truly being able to use it. That is where we as teachers step in. We teach digital natives how to effectively use the technology tools that are all around them. To be able to teach these skills we need the tools. For example; after seeing the horrible photos that my young student took I taught him and all his classmates how to take a good photo. They picked up on it quickly (as I knew they would) and were soon taking exceptional photos, probably better than most of their parents. But I could not have done any of this without the tools, which in this case were the seven digital cameras I have in my computer lab. Teachers need tools to be able to teach 21st Century Skills! Using video with younger students.